I have a soft spot for various artists compilations. I guess it goes back to when I was a kid, and one of my first record purchases, with my own money, was K-tel's Fantastic LP. It was like having a radio station on your turntable, with all of your Top 40 favorites on one disc. So, imagine my surprise when I discovered a various artist comp, out of Denver! 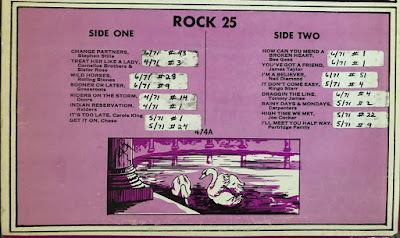 I was intrigued by these plain, neon pink, covers, with a back cover showing swimming swans (I'm guessing because they were issued on the Swan record label). 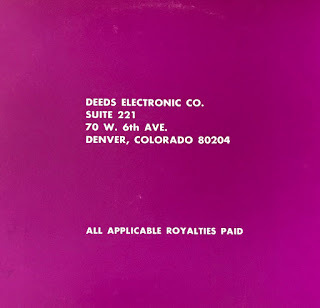 While the Deeds Electronic company shows a Denver address (70 W. 6th Avenue), the story on these albums doesn't even begin to start there. And wow, what a story it is. We actually begin the tale of the Deeds Electronic various artists albums, in the Empire State. Deeds (also known as GAI Audio) was run out of New York, by a businessman named Jack Kessler. I couldn't track down an exact date on the formation of the company, but the intent was to manufacture various artists compilations, much like Ronco, or K-tel. But there was a problem - namely copyright law. 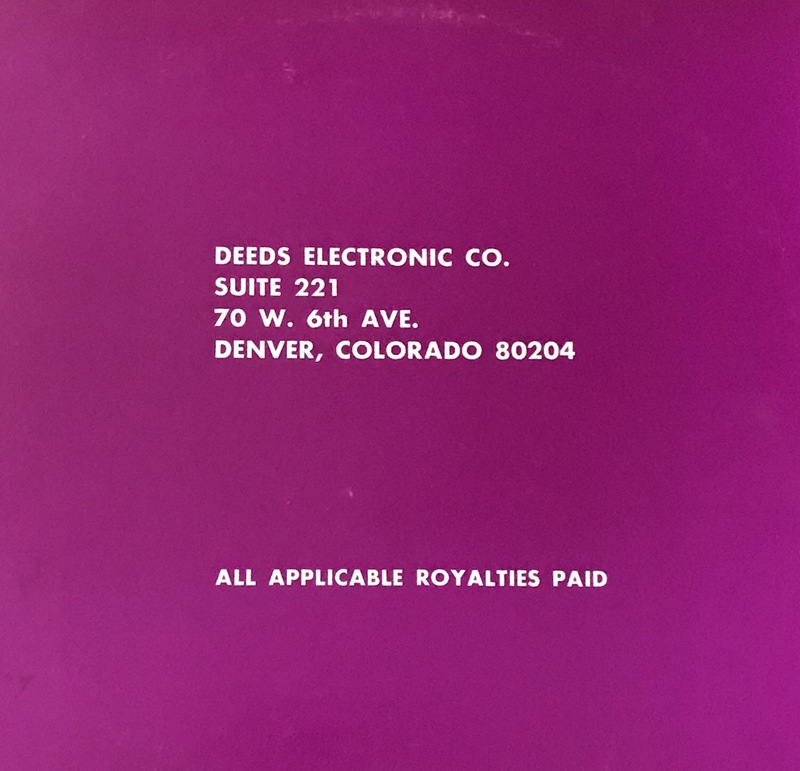 The feds had just begun to crack down on piracy and bootlegged recordings, and Deeds Electronic was in their crosshairs. Deeds had already pressed several dozen different compilations, out of its plant, in Maryland - featuring Johnny Cash, Simon & Garfunkel, Lynn Anderson, Tammy Wynette, Marty Robins, Ray Price, The Rolling Stones, Aretha Franklin, Beth Midler and Roberta Flack. 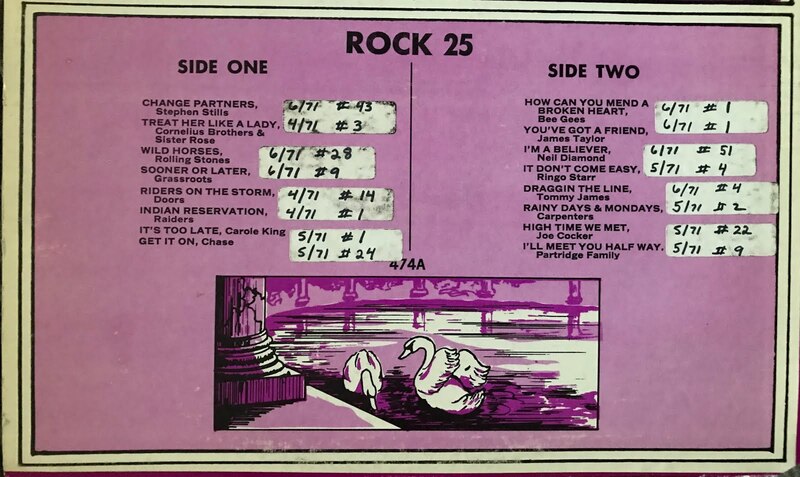 Needless to say the record labels, such as Columbia, were none to happy to find out that another record company had been including their artists on these albums and 8-tracks. Cecil County (Maryland) Sheriff's Police have seized tape-recording equipment and 58,000 bootleg tapes from what is believed to be the largest single operation of its kind in the United States. The raid was conducted Wednesday against the Deeds Music Co., Inc., at the Elk Mills Industrial Park, about 4 miles north of Elkton. The story goes on to say: The tapes and duplicating machines were seized under a court order obtained by Columbia Records, a subsidiary of CBS, and Atlantic Records, who were joined in their action by 44 music publishers. According to the story, the Denver address on the albums was a "mail transfer point." So that Colorado mystery is solved! Cecil County Circuit Court Judge H. Kenneth Mackey heard testimony (bench trial) on Jan. 28, 1974, as Deeds lawyers defended the business. The suing record companies wanted $300,000. Court documents found (I love the Internet) state: After hearing testimony, for six days, Deeds Music Company, Inc., consented to entry of judgment against it in the amount of $150,000. All claims against the remaining defendants were reserved. The latter offered no testimony and rested at the close of plaintiffs' case. On March 1, 1974, at the conclusion of the trial, Judge Mackey, in an oral opinion from the bench, entered judgment against each of the other defendants under the counts alleging unfair competition and civil conspiracy. Very interesting. There are probably lots of these around the country. Why pay for something when you can steal it? Helluva business plan.